GOP presidential hopeful Ted Cruz has an exemplary professional resume. He started out as a lawyer in the Lone Star State before becoming policy advisor in George W. Bush's 2000 presidential campaign. After that, he was elected Junior Senator for the state of Texas. But you haven't seen the best of Ted Cruz until you've seen him debate. It's been evidenced all year – Cruz's poll numbers rise immediately following each GOP debate. After the most recent clash on Dec. 15, Cruz's support climbed 1%, according to CNN on Dec. 17. It had been at 31%, and rose to 32%. The Texas senator took aim at – and held his ground against – another skillful debater, Florida Sen. Marco Rubio. "Border security is national security," Cruz said during an exchange with Rubio. "And one of the most troubling aspects of the Rubio-Schumer Gang of Eight bill is it gave President Obama blanket authority to admit refugees. We have seen what happened in San Bernardino when you are letting people in and the FBI can't vet them, it puts American citizens at risk." Cruz punctuated his speech with a final joke: "I tell you if I'm elected president, we will secure the border. We will triple the border patrol. We will build a wall that works and I'll get [GOP presidential front-runner] Donald Trump to pay for it." Ted Cruz, Debate King of High School. As a teenager, Mr. Cruz was a bit of an oratorical prodigy. His father signed him up for classes at the Free Enterprise Institute when he was 13. There, he spent hours studying the Constitution, the Federalist Papers, and other founding documents. In 1985, he became one of five teens in the institute's constitutional collaborators program. He memorized the Constitution, wrote speeches, and performed for Rotary clubs and other groups across Texas. Young Cruz was the star. Ted Cruz, Debate King of Grad School. 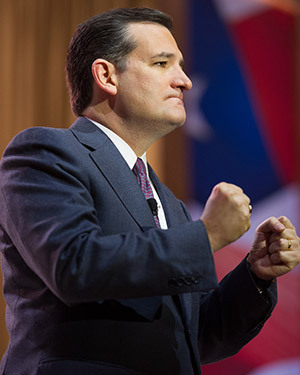 While a grad student at Harvard Law School in 1992, Mr. Cruz was named U.S. National Speaker of the Year. He and his debate partner David Panton also won Team of the Year. They would represent Harvard Law School at the 1995 World Debating Championship, losing in the semi-finals to a team from Australia. Princeton's debate team named a tournament after Cruz: the Ted Cruz Living Memorial Novice Championship.